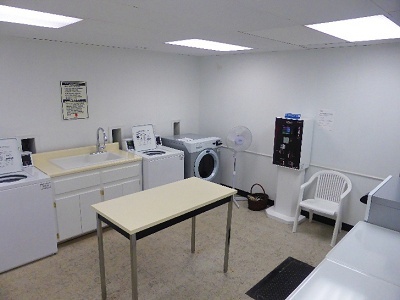 The Laundry Room, open 24/7, is equipped with energy-efficient regular and large-capacity washing machines and dryers. The large-capacity machines can handle a king-sized comforter and other over-sized loads up to 22 pounds. The room features an easy-to-use Wave Point Revalue Station where Laundry Cards can be dispensed and value added to those cards via debit and credit cards or paper money. There is no need for coins!